Father Darin’s Memorial Mass marking the 11th anniversary of his death will be held Monday, September 5th at Holy Spirit Church, 1420 7th Street North, Fargo, North Dakota 58102 at 5:20 P.M. A free will lunch was served after with the proceeds going to the Father Darin Memorial Scholarship at Holy Spirit. The 11th Annual Catoctin Pregnancy Center Run for Life in memory of Father Darin Didier was held on Saturday, the 19th of September, at Mont St. Mary’s University. For more information on the run for life, click here!. For a Catholic review on the Annual run for life, click here. Thank you for visiting and paying tribute to Father Darin Didier. Please feel free to navigate his site. We welcome you to visit prayerfully and encourage your healing prayers as Father Darin is said to be the source for interecession for many miracles! Please take a moment to reflect on Father Darin's Perspective on suffering. Father Darin John Didier was born September 27, 1972 in St. Paul, MN. He attended school in Alexandria, MN from kindergarten until he graduated from Jefferson High School in 1991. He earned a Master’s Degree in Physical Therapy from the University of North Dakota in 1997. He studied at Cardinal Muench Seminary, Fargo, ND in the 1997-98 academic year and later entered Mount St. Mary’s Seminary in Emmitsburg, MD. In 2000, while in the seminary, he asked the Lord for “a piece of the cross”. After having grown enough in faith through grace, his prayer was answered as he was diagnosed with a rare cancer in June of 2003. Despite his ever-worsening physical condition he persevered in faith, hope and obedience to God’s will for his life. 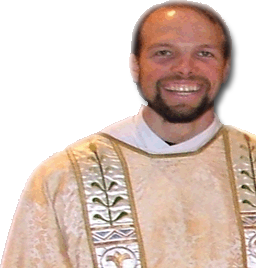 He was ordained a transitional deacon for the Catholic Diocese of Fargo on May 22, 2004 having just completed a three-month hospital stay. In July of 2004 his cancer came back worse than ever. God was giving him all he asked for and more-the grace to carry his cross humbly and without complaint. By submitting his will and his life to God his prayers were once again answered when he was ordained to the priesthood by Bishop Samuel Aquila on June 4, 2005 at St. Mary’s Cathedral in Fargo, ND. Father Darin served as parochial vicar at Holy Spirit Church in Fargo, ND alongside Father Jeffrey Wald starting June 22, 2005 until his death on September 6, 2005. Darin was always running and achieved many honors including All-State Minnesota in high school. At the University of North Dakota, where he received a Masters Degree in Physical Therapy, he also lettered in track and cross-country.